This is called "The Weekender Air Vest". There are others out there - but this one is light weight for layering. I am not talking about wearing it to work - or for daily stuff. I wouldn't wear it to the grocery store. duties. It would also haul my cameras, etc., because I'd like to do some info work, etc. I like black, fairly slim fitting pants - lightweight and heavy weight. I'd want a bit of a wardrobe to cover the variables. Recently at IJRS we have been discussing the terrible weather and how we individually would prepare. ... but that isn't saying much. Jedi should be packed for emergency - even if it's to help a friend or community situation. I like winter camping. I did a lot of it in Minnesota. I prefer it to summer camping because it's clean and critterless. In other ways it's very much of a challenge. whatever I had washed and dried quickly. Make them as light weight as possible. I've never been a high maintenance chick. My toiletries are some moisturizer and a comb for "off days". I would want all purpose soap/shampoo and a toothbrush/paste. Deoderant. Quick wash and dry underthings, socks, etc. I'm curious what other people would choose to have in a "to go" kit. ESPECIALLY WHAT JEDI MIGHT WEAR for this episode of the JediKit. I'd say I lightweight windproof/waterproof hooded anorak for a top coat. Thinsulate liner to wear zipped in or alone. Good tight knit warm sweater (non bulky). A lightweight but strong vest lots of pockets. Warm socks and cotton socks. Lightweight all weather hiking boots. Underthings - sporty so could also use for swimming or sitting around *modest quick-wash/dry. What else for something to wear? any great or new product? One item that will make life very easy and reduce other things you need to bring are baby wipes. You can wash your whole body with one (or two) good baby wipes and it's very refreshing, especially in the summer when you've been sweating all day. And don't forget your water gear. I'm still not fond of the plastic taste in a camelback, but it's better than nothing and easy to carry. Having a military style belt or load bearing vest allows you to carry canteens as well as other pouches for things like first aid kits and any other supplies you'd need (which depends upon the situation). Down in Texas, cold weather gear is needed for maybe 2 weeks out of the year. lol But when we go to Calgary we'll need much more cold weather gear, plus bear spray. When we go hiking I plan to get a military style vest (which are all much fancier than the load bearing vest I was issued) so I can carry as much on me as possible leaving my pack for clothes and food and such. I hope that helps with a few ideas. My old Army fatigues (cotton not the polyester) had some nice pockets... some large enough to slip a paperback book into it without effort. In some Military Surplus stores you can those or EMT black pants which also have lots of exterior pockets for meds and equipment. Check online or in the city Military Surplus stores and sometimes you can get some real bargains. Same for the weight distribution harnesses, canteens, etc. Another 'thing' to consider is packing some blankets and clothes in one of those "... compress them flat..." vacuum bag thingees. Makes for something easier to handle/carry and takes up less space... and again, semi water proof, and 'preserved' until needed. Last Edit: 4 years 9 months ago by Kol Drake. I agree about the cargo pants - and I don't know how hard-core many of you have camped but I am speaking of having something "to go" that could be used for from Jedi Gatherings to projects to possible disaster preparedness. When you have to wash stuff on the road, bicycle or hiking, the plastic lasts about two weeks tops. Otherwise the plastic is great... Those things for dirty clothes on trips will save your sanity... heh. Those metal boxes are incredible (I actually love the look!) - but they're kind of clunky for on-the-go. But it would be great for the preparedness pantry for a good kit. One was how to function on the move and the other was how to function during a basic disaster at homBue. Have you learned about gathering food in the wild? If you can identify plants safely that reduces your food needs, or at least supplements them. I wanted to take the class here this past weekend but didn't have the money until a few days later (doh!). I might just need to contact the teacher to see when he's teaching again so I can take it before the gathering. It would be really great to do some foraging for a salad or something. I grew up "foraging" - and do so in my own "urban" yard where I live. (Now that the old owner's chemicals are gone - I had to wait one year). Detroit has become a center for urban gardening for - well - obvious reasons - but it's really raised the consciousness of our own space's earth, food, and it is very cool I must say. But foraging is a really interesting and fun experience. Get a good book, look online, and start looking around. It's amazing what is out there that is completely edible. Survival of emergencies seems to this month's theme. They were interviewing a state park rep who gives a one day workshop on basic survival. Not so much what flowers or roots to forage for but basic stuff about what is 'necessary' and what to pack. Like... you can go a couple of weeks without food... although some folks need something for blood sugar stability... so typically, a 1-3 day emergency does not HAVE TO have tons of food on hand. Perhaps some power bars or slim jims or such. 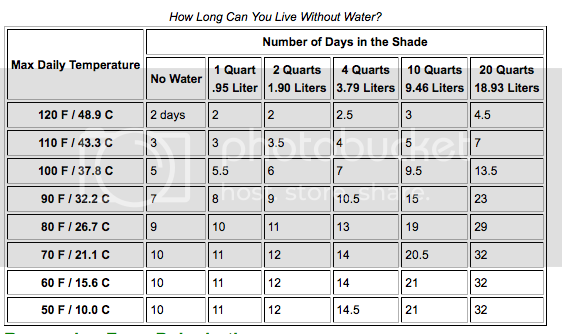 Folks can go about 3 days with no water unless the temp is super high. So, for 1-3 day emergencies, don't need that although you can carry purification pills easily enough. 1-3 days is more about heat and shelter. Learn how to use a flint and steel... or a magnesium bar and flint. Learn what makes good dry starter tinder (or pre make a small film canister 'load' of cotton balls steeped in petroleum jelly). Read up on some very basic shelters. Carry a roll of oversized garbage bags -- impromptu rain ponchos, or help plug 'holes' in shelters or line a hole to collect water, etc. Never sleep on the ground -- it stays close to 60 some degrees... it robs body heat. Always figure how to make 'piles' from leaves or pine needles or punked wood... it insulates as well as covers shelters. You can work through the logic and make up emergency bags by 'levels' -- from one in a ziplock 2 or 5 gallon plastic bag to small 'hand purse' sized kits to stuffed backpacks to loaded minivans. Plus, as with any 'plans'... think about what you might do or go. For minor power outages, stay home. For floods, earthquakes, whatever -- where would you go instead? and how tough would it be to get there with no vehicle? And it goes on and on. Some things you can 'run' from while others will 'be there' no matter where you go... best to have some inkling instead of trying to figure it all out while it is all hitting the fan. Last Edit: 7 years 10 months ago by . I'm going to disagree on the water statement Kol. While yes, a person may survive a few days, that doesn't mean they are capable of doing anything. Dehydration quickly robs the body of physical and mental strength. I saw people go down with heat exhaustion after just a short time out in the heat. Considering that an emergency will often put us in the situation of high adrenaline, if not straight out exertion, they will be running hotter and needing more water. To discount the need for water in a 1-3 day kit is irresponsible. Even in an urban environment water can quickly be too contaminated to safely drink after an emergency. Note that i did say "... if the temp was super high..."
If you are talking New Orleans, mid spring/summer with high humidity and high temps... then yes, it is advisable to have water handy. However, there is also the consideration of how much water can you properly carry... along with all your gear if you are on foot? One gallon of water weighs around 8..35 pounds. It is 'suggested' a person drinks 8 eight ounce glasses of water a day -- approximately 2 quarts -- so a bit over 4 pounds PER day. Unless folks are used to packing a 50 pound pack PLUS their water and food, trying to cart enough water is a bit silly imo. If you are considering using a vehicle, fine. Load it up. However, be aware, for every pound of water you take, you are also 'taking away' from other items which might be just as essential in short run and even in the longer haul. With purification -- either pills or bleach or iodine or boiling -- one can find water available in some form... unless you are on the high seas or in the middle of Death Valley. It is why I also said, "... you can carry purification pills easily enough." Pills for a MONTH of water is a hell of a lot lighter then 3 or more days of water if you having to pack and carry it. I agree. I was responding to the idea of it not being necessary because a person can live for days. We bought the Katadyn Micropur water purifying tablets which according to research (but not personal testing) taste the best and work well. I also took the recommendation to have powdered koolaid to cover the taste if it's too gross after purification. It might be even better to have powdered gatorade since that will provide electrolytes needed once everything is sweat out. If preparing a kit for shelter in place though, there's no reason not to have quite a few gallons of water on hand.